For the fifth consecutive year, My Guys Moving was voted one of the Best Moving Companies in Loudoun County, VA. The Times-Mirror moved the Best of Loudoun 2018 poll to a new platform that allowed direct voting, so the newspaper saw a large dip in the average number of categories in which users voted. Last year, the average was 10 categories per user. This year, the average was only 3-4 categories. Nevertheless, a total of 33,029 participants voted in the 2018 contest, collectively casting 116,000 votes for personalities, attractions and businesses in Loudoun County. To see all the winners, visit the publication’s special section. Other first-place winners were Hillsboro Charter Academy for Public School, Loudoun Country Day School for Private School, and Leesburg Open Arms for Childcare/Preschool. Downtown Leesburg was voted Best Place to Be Seen, and One Loudoun was runner-up. Best Coffee Shop was The Blend in Broadlands. Fine Dining went to Tuscaroara Mill with Magnolia’s in Purcellville as runner-up. Right around the corner, Best Ice Cream went to Gruto’s. Passion Fin was voted Best Sushi (but I have to say, my personal favorite is Chin-Chin Cafe in Ashburn). And for a date night at the Best Movie Theater in Loudoun, Alamo Drafthouse Cinema got the award. 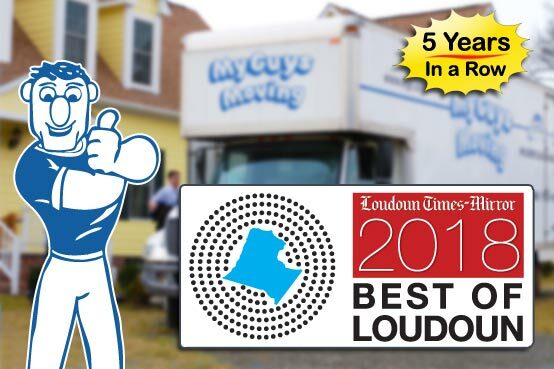 My Guys Moving & Storage is honored to be voted one of the top-rated moving companies in Loudoun County in the category of Moving Service for the 5th year in a row. We will continue to give back to the local communities we serve.